Lichen planus is one of mucocutaneous disorder in which oral involvement precedes the appearance of other symptoms or lesions at other locations. Etiology of lichen planus as such is not known clearly, but at present it has been linked to autoimmune disorder For a general practitioner it is very important to know the important clinical features, diagnosis and treatment plan for this disease to differentiate it from other lesions. Now a days novel drug therapy and use of custom trays are of special concern for a dentist in management of oral lichen planus lesions. The mouth is a mirror of health or disease, a sentinel or early warning system. The oral cavity might well be thought as a window to the body because oral manifestations accompany many systemic diseases. In many instances, oral involvement precedes the appearance of other symptoms or lesions at other locations. Most of the oral mucosa is derived embryologically from an invagination of the ectoderm and perhaps not surprisingly, this, like other similar orifices, may become involved in disorders that are primarily associated with the skin. In the oral cavity, the disease assumes somewhat different clinical appearance than on the skin, and is characterized by lesions consisting of radiating white, gray, velvety, thread-like papules in a linear, annular and retiform arrangement forming typical lacy, reticular patches, rings and streakes. A tiny white elevated dot is present at the intersection of white lines known here as striae of Wickham as compared to Wickham striae in skin. The lesions are asymptomatic, bilaterally/symmetrically anywhere in the oral cavity,  but most common on buccal mucosa, tongue, lips, gingiva, floor of mouth, palate and may appear weeks or months before the appearance of cutaneous lesions. It is the most common clinical form of this disease and presents with fi ne, asymptomatic intertwined lace-like pattern called "Wickham striae" in a bilateral symmetrical form and involves the posterior mucosa of the cheek in most cases. It is the most unusual clinical form, exhibiting blisters that increase in size and tend to rupture, leaving the surface ulcerated and painful. Nikolsky's sign may be positive. Keratotic lesions are usually present on the attached gingiva as small raised round white papules of pinhead size with a flattened surface. Atrophic and Erosive: Produce the desquamative gingivitis. The history, typical oral lesions and skin or nail involvement are usually sufficient to make a clinical diagnosis of OLP. However, a biopsy is the recommended procedure to differentiate it from other lesions. There are no consistent serological changes associated with OLP but some patients do present an elevated antinuclear antibody (ANA) titer. Blood biochemistry and full blood examination (FBE) should also be included in the full patient workup. Local drug delivery can provide a more targeted and efficient drug-delivery option than systemic delivery for diseases of the oral mucosa. The main advantages of local drug delivery include (i) reduced systemic side effects, (ii) more efficient delivery as a smaller amount of drug is wasted or lost elsewhere in the body, and (iii) targeted delivery as drugs can be targeted to the diseased site more easily when delivered locally, thereby reducing side effects. However, potential for novel drug delivery systems in dentistry has not yet been fully realized and further research is still needed in order to improve treatment outcomes. Surgical excision, cryotherapy, CO 2 laser, and ND:YAG laser have all been used in the treatment of OLP. In general, surgery is reserved to remove high-risk dysplastic areas. Photo chemotherapy, a new method in which clinician uses ultraviolet A (UVA) with wavelengths ranging from the 320 to 400 nm, after the injection of psoralen is also used. Relaxation, meditation and hypnosis have positive impact on many cutaneous diseases and help to calm and rebalance the inflammatory response which can ameliorate inflammatory skin disorders. OLP is a very common oral dermatitis and is one of the most frequent mucosal pathoses encountered by dental practitioners. It is imperative that the lesion is identified precisely and proper treatment be administered at the earliest. A proper understanding of the pathogenesis, clinical presentation, diagnosis of the disease becomes important for providing the right treatment. Mehrotra V, Devi P, Bhovi TV, Jyoti B. Mouth as a mirror of systemic diseases. Gomal J Med Sci 2010;8:235-41. Gupta SB, Chaudhari ND, Gupta A, Talanikar HV. Int J Pharm Biomed Sci 2013;4:59-65. Wilson E. Oralleichenplanus. J Cutan Med Dis Skin 1869;3:117-32. Rhodus NL, Myers S, Kaimal S. Diagnosis and management of oral lichen planus. Northwest Dent 2003;82:17-9. Sharma A, Bia³ynicki-Birula R, Schwartz RA, Janniger CK. Lichen planus: An update and review. Cutis 2012;90:17-23. Kaposi, M. Lichen ruberpemphigoides. Arch DermatolSyph (Berl) 1892;24:343-6. Wickham LF. Sur unsigne pathognomoniquedelichen du Wilson (lichen plan) stries et punctuations grisatres. Ann Dermatol Syph 1895;6:17-20. Black MM. The pathogenesis of lichen planus. Br J Dermatol 1972;86:302-5. Kaposi M. Pathology and Treatment of Diseases of the skin for practitioners and students. Translation of the Last German Edition under the Supervision of James C. Johnston, MD. New York, NY: William Wood and Company; 1895. Le Cleach L, Chosidow O. Clinical practice. Lichen planus. N Engl J Med 2012;366:723-32. Singh OP, Kanwar AJ. Lichen planus in India: An appraisal of 441 cases. Int J Dermatol 1976;15:752-6. Ismail SB, Kumar SK, Zain RB. Oral lichen planus and lichenoid reactions; Etiopathogenesis, diagnosis, management and malignant transformation. J Oral Sci 2007;49:89-106. Shafer WG, Hine MK, Levy BM. Shafer's textbook of oral pathology.6 th ed. Elsevier publications: Noida, India 2009. p. 800. Boorghani M, Gholizadeh N, Zenouz AT, Vatankhah M, Mehdipour M. Oral lichen planus: Clinical features, etiology, treatment and management; A review of literature. J Dent Res Dent Clin Dent Prospect 2010;4:3-9. Shekar C, Ganesan S. Oral lichen planus: Review. J Dent Sci Res 2011 ; 2:1:62-87. Sousa FA, Rosa LE. 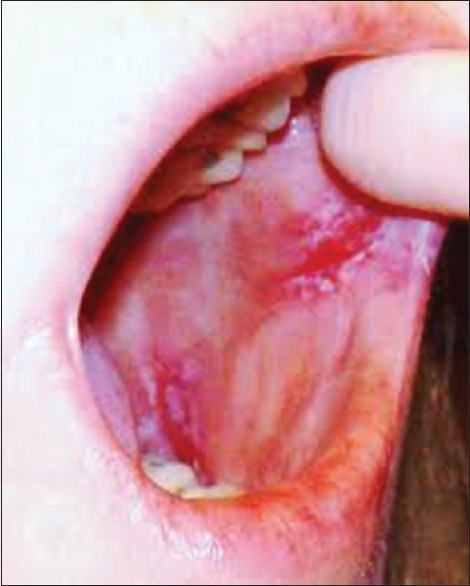 Oral lichen planus: Clinical and histopathological considerations. Braz J Otorhinolaryngol 2008;74:284-92. 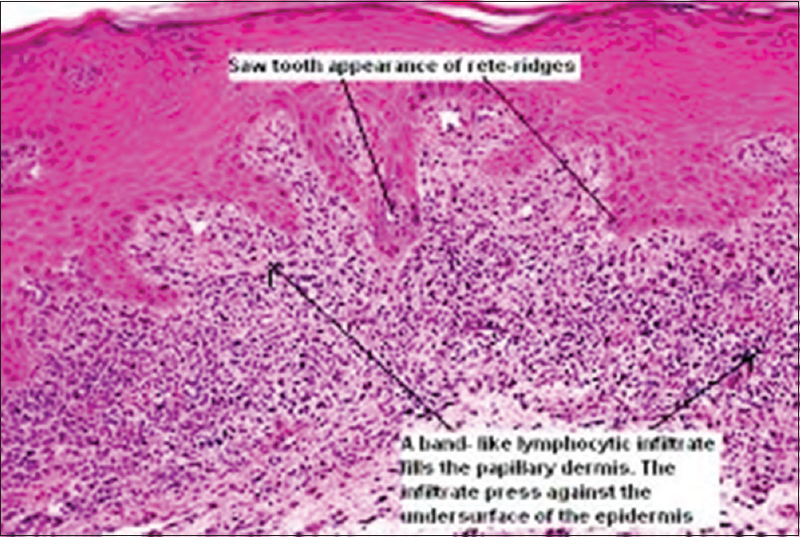 Sharma S, Saimbi CS, Koirala B. Erosive oral lichen planus and its management: A case series. JNMA J Nepal Med Assoc 2008;47:86-90. Ognjenovic M, Karelovic D, Cindro VV, Tadin I. Oral lichen planus and HLA A. Coll Antropol 1998;22:89-92. McCartan BE, Lamey PJ. Expression of CD1 and HLA-DR by Langerhans cells (LC) in oral lichenoid drug eruptions (LDE) and idiopathic oral lichen planus (LP). J Oral Pathol Med 1997;26:176-80. Watanabe T, Ohishi M, Tanaka K, Sato H. Analysis of HLA antigens in Japanese with oral lichen planus. J Oral Pathol 1986;15:529-33. Porter K, Klouda P, Scully C, Bidwell J, Porter S. Class I and II HLA antigens in British patients with oral lichen planus. Oral Surg Oral Med Oral Pathol 1993;75:176-80. Sun A, Wu YC, Wang JT, Liu BY, Chiang CP. Association of HLA-te22 antigen with anti-nuclear antibodies in Chinese patients with erosive oral lichen planus. Proc Natl Sci Counc Repub China B 2000;24:63-9. Serrano-Sánchez P, Bagán JV, Jiménez-Soriano, Sarrión G. Drug induced oral lichenoid reactions. A literature review. J Clin Exp Dent 2010;2:e71-5. Scully C, Beyli M, Ferreiro MC, Ficarra G, Gill Y, Griffiths M, et al. Update on oral lichen planus: Etiopathogenesis and management. Crit Rev Oral Biol Med 1998;9:86-122. Issa Y, Brunton PA, Glenny AM, Duxbury AJ. Healing of oral lichenoid lesions after replacing amalgam restorations: A systematic review. Oral Surg Oral Med Oral Pathol Oral Radiol Endod 2004;98:553-65. Wray D, Rees SR, Gibson J, Forsyth A. The role of allergy in oral mucosal leisons. QJM 2000;93:507-11. Moravvej H, Hoseini H, Barikbin B, Malekzadeh R, Razavi GM. Association of Helicobacter pylori with lichen planus. Indian J Dermatol 2007;52:138-40. Vainio E, Huovinen S, Liutu M, Uksila J, Leino R. Peptic ulcer and Helicobacter pylori in patients with lichen planus. Acta Derm Venereol 2000;80:427-9. Hulimavu SR, Mohanty L, V Tondikulam N, Shenoy S, Jamadar S, Bhadranna A. No evidence for Helicobacter pylori in oral lichen planus. J Oral Pathol Med 2014;43:576-8. Ertugrul AS, Arslan U, Dursun R, Hakki SS. Periodontopathogen profile of healthy and oral lichen planus patients with gingivitis or periodontitis. Int J Oral Sci 2013;5:92-7. Mehdipour M, Zenouz AT, Hekmatfar S, Adibpour M, Bahramian A, Khorshidi R. Prevalence of Candida species in erosive oral lichen planus. J Dent Res Dent Clin Dent Prospect 2010;4:14-6. Shivanandappa SG, Ali IM, Sabarigirinathan C, Mushannavar LS. Candida in oral lichen planus. J Indian Aca Oral Med Radiol 2012;24:182-5. Gorsky M, Epstein JB. Oral lichen planus: Malignant transformation and human papilloma virus: A review of potential clinical implications. Oral Surg Oral Med Oral Pathol Oral Radiol Endod 2011;111:461-4. Yildirim B, Senguven B, Demir C. Prevalence of herpes simplex, Epstein Barr and human papilloma viruses in oral lichen planus. Med Oral Patol Oral Cir Bucal 2011;16:e170-4. Wen S, Tsuji T, Li X, Mizugaki Y, Hayatsu Y, Shinozaki F. Detection and analysis of human papillomavirus 16 and 18 homologous DNA sequences in oral lesions. Anticancer Res 1997;17:307-11. Kumari R, Singh N, Thappa DM. Hypertrophic lichen planus and HIV infection. Indian J Dermatol 2009;54:S8-10. Konidena A, Pavani BV. Hepatitis C virus infection in patients with oral lichen planus. Niger J Clin Pract 2011;14:228-31. Oliveira Alves MG, Almeida JD, Guimarães Cabral LA. Association between hepatitis C virus and oral lichen planus: HCV and oral Lichen Planus. Hepat Mon 2011;11:132-3. Patil S, Khandelwal S, Rahman F, Kaswan S, Tipu S. Epidemiological relationship of oral lichen planus to hepatitis C virus in an Indian population. Oral Health Dent Manag 2012;11:199-205. Abbate G, Foscolo AM, Gallotti M, Lancella A, Mingo F. Neoplastic transformation of oral lichen: Case report and review of the literature. Acta Otorhinolaryngol Ital 2006;26:47-52. Georgakopoulou EA, Achtari MD, Achtaris M, Foukas PG, Kotsinas A. Oral lichen planus as a preneoplastic inflammatory model. J Biomed Biotech 2012;12:1-9. Eltawil M, Sediki N, Hassan H. Psychobiological aspects of patients with lichen planus. Curr Psychiatr 2009;16:370-80. Chaudhary S. Psychosocial stressors in oral lichen planus. Aus Dent J 2004;49:192-5. Bajaj DR, Khoso NA, Devrajani BR, Matlani BL, Lohana P. Oral lichen planus: A clinical study. J Coll Physicians Surg Pak 2010;20:154-7. Rajendran R. Oral lichen planus. J Oral Maxillofac Pathol 2005;9:3-5. Gorsky M, Epstein JB, Hasson-Kanfi H, Kaufman E. Smoking habits among patients diagnosed with oral lichen planus. Tob Induc Dis 2004;2:103-8. Trivedy CR, Craig G, Warnakulasuriy S. The oral health consequences of chewing areca nut. Addict Biol 2002;7:115-25. Stoopler ET, Parisi E, Sollecito TP. Betel quid-induced oral lichen planus: A case report. Cutis 2003;71:307-11. Reichart PA, Warnakulasuriya S. Oral lichenoid contact lesions induced by areca nut and betel quid chewing: A mini review. J Investig Clin Dent 2012;3:163-6. Torrente-Castells E, Figueiredo R, Berini-Aytés L, Gay-Escoda C. Clinical features of oral lichen planus. A retrospective study of 65 cases. Med Oral Patol Oral Cir Bucal 2010;15:e685-90. Albrecht M, Bánóczy J, Dinya E, Tamás G Jr. Occurrence of oral leukoplakia and lichen planus in diabetes mellitus. J Oral Pathol Med 1992;21:364-6. Ahmed I, Nasreen S, Jehangir U, Wahid Z. Frequency of oral lichen planus in patients with noninsulin dependent diabetes mellitus. J Pak Assoc Derm 2012;22:30-4. Lundström IM. Incidence of diabetes mellitus in patients with oral lichen planus. Int J Oral Surg 1983:12:147-52. Zhou XJ, Sugarman PB, Savage NW, Walsh LJ, Seymour GJ. Intra-epithelial CD8+T cells and basement membrane disruption in oral lichen planus. J Oral Pathol Med 2002;31:23-7. Sugerman PB, Satterwhite K, Bigby M. Autocytotoxic T-cell clones in lichen planus. Br J Dermatol 2000;142:449-56. Regezi JA, Dekker NP, MacPhail LA, Lozada-Nur F, McCalmont TH. Vascular adhesion molecules in oral lichen planus. Oral Surg Oral Med Oral Pathol Oral Radiol Endod 1996;81:682-90. Srinivas K, Aravinda K, Ratnakar P, Nigam N, Gupta S. Oral lichen planus-Review on etiopathogenesis. Natl J Maxillofac Surg 2011;2:15-6. Lodi G, Scully C, Carozzo M, Griffiths M, Sugerman PB, Thongprasom K. Current controversies in oral lichen planus: Report on an international consensus meeting. Part 1. Viral infections and etiopathogenesis. Oral Surg Oral Med Oral Pathol Oral Radiol Endod 2005;100:40-51. Zhou XJ, Sugerman PB, Savage NW, Walsh LJ. Matrix metalloproteinases and their inhibitors in oral lichen planus. J Cutan Pathol 2001;28:72-82. Zhao ZZ, Sugerman PB, Zhou XJ, Walsh LJ, Savage NW. Mast cell degranulation and the role of T cell RANTES in oral lichen planus. Oral Dis 2001;7:246-51. Roopashree MR, Gondhalekar RV, Shashikanth MC, George J, Thippeswamy SH, Shukla A. Pathogenesis of oral lichen planus-a review. J Oral Pathol Med 2010;39:729-34. Davarmanesh M, Dehaghani AS, Deilami Z, Monabbati A, Dastgheib L. Frequency of genital involvement in women with oral lichen planus in southern Iran. Derm Res Prac 2012;1-7. Radwan-Oczko M. Topical application of drugs used in treatment of oral lichen planus lesions. Adv Clin Exp Med 2013;22:893-8. Porter SR, Bain SE, Scully CM. 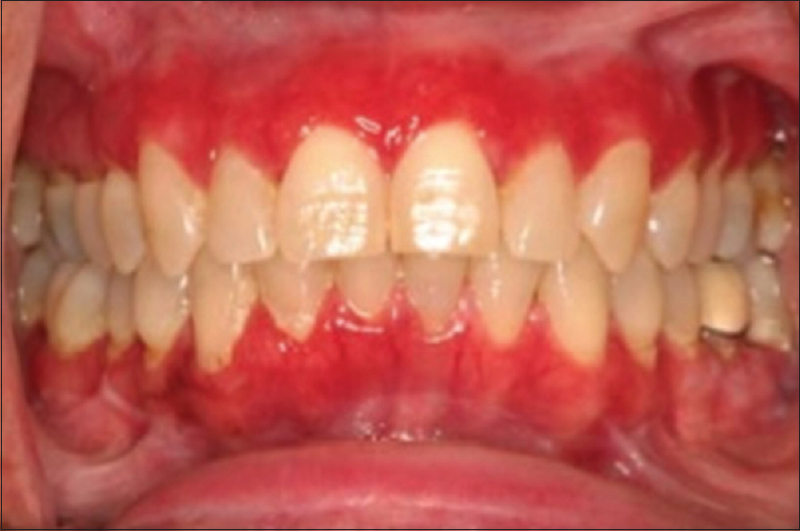 Linear IgA disease manifesting as recalcitrant desquamative gingivitis. Oral Surg Oral Med Oral Pathol 1992;74:179-82. Pelisse M. The vulvo-vaginal-gingival syndrome: A new form of erosive lichen planus. Int J Dermatol 1989;28:381-4. Gonzalez-Moles MA, Scully C, Gil-Montoya JA. 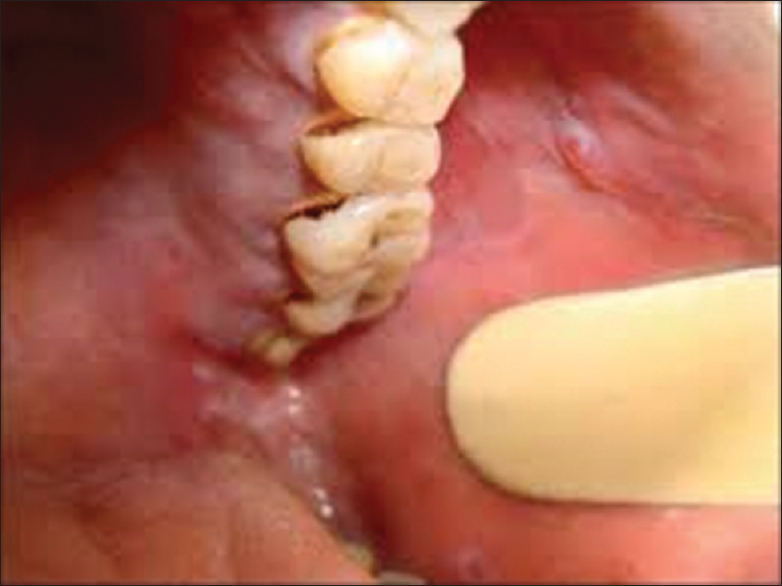 Oral lichen planus: Controversies surrounding malignant transformation. Oral Dis 2008;14:229-43. Mignogna MD, Lo Muzio L, Lo Rosso L, Fedele S, Ruoppo E, Bucci E. Clinical guidelines in early detection of oral squamous cell carcinoma arising in oral lichen planus: A 5- year experience. Oral Oncol 2001;37:262-7. Sahebjamee M, Arbabi-Kalati F. Management of oral lichen planus. Arch Iranian Med 2005;8:252-6. Mishra SS, Maheshwari T. NU. Local drug delivery in the treatment of oral lichen planus: A systematic review. Int J Pharm Bio Sci 2014;5:716-21.